TABLES: four(4) 8ft. rectangles, four(4) 6ft. rectangles, three(3) 4ft. rectangles, and fourteen(14) 60” rounds. 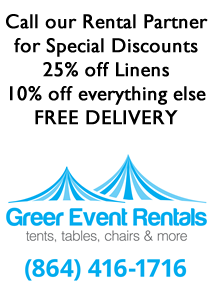 LINENS: Each table includes a 25% discount on a linen from Greer Event Rentals (Full length, lap length and skirting are available in many colors). CHAIRS: Use of 100 black or white plastic chairs, or $100 credit at Greer Event Rentals for a different chair. Use of kitchenette (stove, microwave, sink, refridgerator, storage space). Men's and Women's Handicap accessible bathrooms. When you book any combination, you also receive FREE the time between the blocks. We usually use that time for transitioning between 2 events, but give that to you for FREE if you have both blocks. If your event/seminar will need the banquet hall for more than one (1) day, you qualify for special rates.